We’re having an uncharacteristically cold winter this year. It’s made me miss the fall even more this time around than usual. Those mild days and the colors that were like an explosion of warmth everywhere I looked. To hold onto the essence of that warmth, I designed these two necklaces in October. The leaves were still in full color and the trees were not bare. 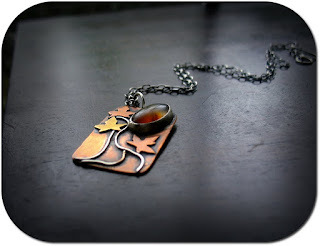 I used a mixture of metals, sterling, copper and brass to translate that warmth, and in one of the pendants an orange and white agate with a streak of black is encased by silver and adorns the surface. Friends asked me to put these two in the store, but I never did because I wasn’t ready. These were experiments for me and an expression of my growth as a metalsmith. I was nervous about them even if the reception outside of the cyber world was everything an artist could hope for. I wasn’t ready to put them out into the world of Etsy yet. Maybe next year. For now, I wear these when I’m missing my favorite time of year, and also as a reminder that it will come again and to treasure the in between until it gets here. I agree with the others who love it! Have a great weekend! 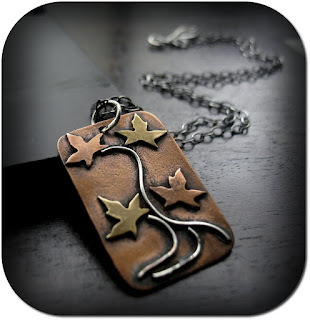 I can feel the warmth, these two pendants are extraordinary! The fall hung around for a nice little bit here in Tennessee and the colors were so gorgeous in the Smokies, I was ready to pack it up and move there (which I would love to do anyway!). I love the way you've photographed them as well.